Yesterday we went out for happy hour here in Key west and decided we wanted to try a new place. So we walked up Duval Street, like we have done so often, but instead of hitting one of the many bars there, we went down all the small side streets just to see what else is available in the area. So we find this little place called “2 Cents Restaurant & Pub” down on Applerouth Lane. You can’t see it when you look down the street from Duval. All you see from out there is the sign from Leather Masters, and that probably doesn’t attract the majority. It’s a really nice bar and restaurant. They have a outside garden style setting and a smaller inside bar area. It was so hot and humid so we opted for the air conditioned bar inside. So we sit at the bar and we are handed two menus and a small bucket of bacon. wait.. . what?? Yes, a small bucket of delicious and crispy bacon. I fell in love with place immediately! We ordered a couple of margaritas and I snapped a quick pic. It was totally awesome!! 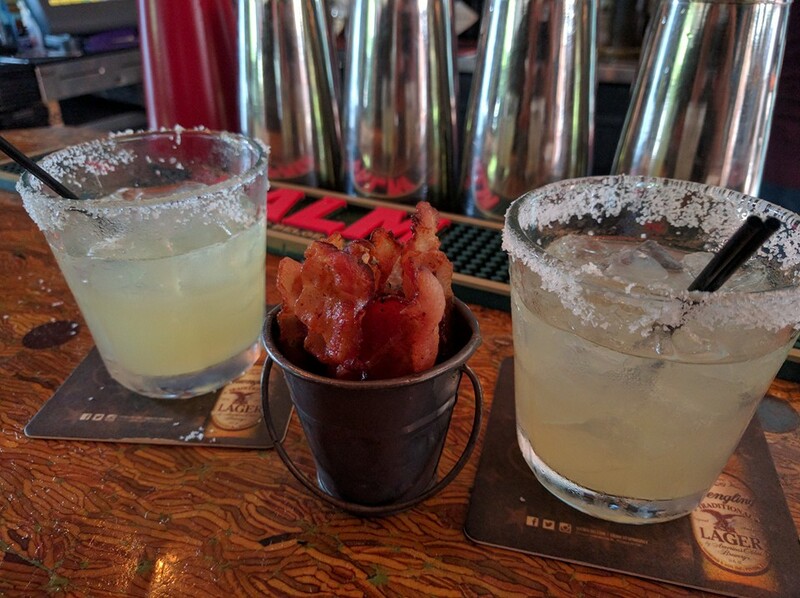 We staid for a while and got quite a few drinks and a whole bunch of bacon. They kept bringing new bacon buckets as we finished them up. I think I’ll get a heart attack if I go there again anytime soon. They also have a fun thing going on when you order your drinks. You roll a dice and 1 = $1 for the drink, 2 = $2, 3 = half off, 4, 5 or 6 = full price. I had a few $1 beers, but of course when we rolled for the $10 margarita we both hit full price. Oh, well. Their appetizers were delicious. We had the wings which was garlic and cilantro marinated with sweet chili sauce. We also had their Spiced Pork Meatballs in Thai peanut sauce. Talk about yummy!